Why do so many investors make the same mistakes repeatedly - being too bullish or too bearish at just the wrong times? Because they forget. Forgetting pain is an instinct - humans have evolved that way to better cope with the problems of survival. But for the complex and often counterintuitive world of investing, it causes serious errors. "This time it's different" are the four most expensive words in the English language (according to investing legend Sir John Templeton). Yet many investors routinely fall into the trap of thinking "now" (whenever "now" is) is different somehow. 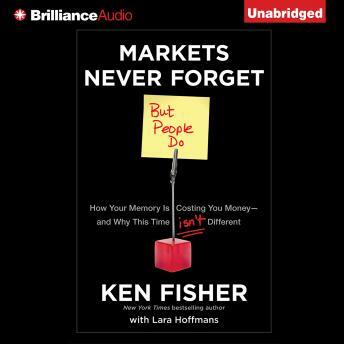 In Markets Never Forget (But People Do): How Your Memory Is Costing You Money - and Why This Time Isn't Different, four-time New York Times bestselling author Ken Fisher shows readers how their memories play (often costly) tricks on them-and how they can combat their faulty memories with just a bit of history. This isn't to say history repeats itself perfectly. It doesn't - but a recession is a recession. Some are vastly worse than others - but investors have lived through them before. Credit crises aren't new, nor are bear markets - or bull markets. Geopolitical tension is as old as mankind, as is war and even terrorist attacks. Understanding how investors have reacted to similar past events can help guide investors in shaping better forward-looking expectations. The past never predicts the future, but it can reduce guesswork about what's ahead. In this book, Fisher takes aim at some major market memory mishaps - like the idea stocks have become inherently more volatile or that wildly above- or below-average returns are abnormal. He shows how, early in every recovery, investors don't believe in it - often at a huge cost. And he shows how, in investing, ideology is deadly. Most important, he teaches how you can use history as one powerful tool to help begin reducing your error rate and help begin getting better investing results.